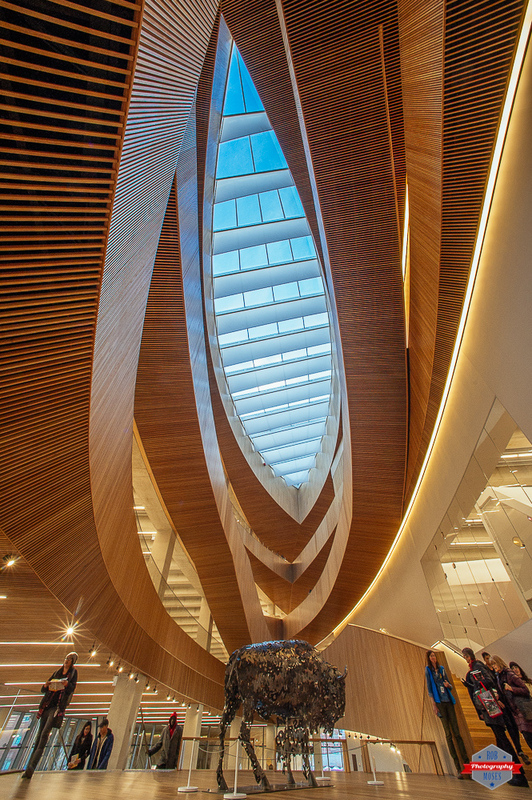 The interior of the new Calgary Library is wonderful! Since the library opened I have seen tons of pictures of the outside and inside and every little corner of the place. I really enjoyed a lot of the pictures I had seen and wanted to get a shot of my own. I didn’t want to just take a picture that other people had already shot over and over again. This required a little walking around and a lot of test shots. I made my way to each corner of the staircases and took a look through my viewfinder, but each time I wasn’t convinced my shot would be very unique. After going all the way to the top and back to the bottom I was passing by this buffalo sculpture and thought that incorporating it into my shot would be a nice touch. So I started shooting photos, but still I wasn’t convinced I had anything. Then I idea to lay on the floor get low enough the include the buffalo and the skylight hit me and after a little laying around I had my shot! Some days you go out to shoot a photo that hasn’t been done and it just doesn’t work out, then other days you end up laying on your back in the middle of a public space and everything you wanted in your photo comes together! I love it when a shot works out they way you’d hoped it would. This entry was posted in Architecture and tagged 14mm, Alberta, architecture, Art, artist, beautiful, buffalo, buildings, Calgary, Calgary Public Library, Canada, canadian, city, City Life, D3s, design, downtown, interior, library, metro, modern, Native American, Nikkor, Nikon, pretty, Sculpture, sky, stairs, statue, story, Tlingit, ultra wide, uptown, Urban, wide angle, wood, wood work, yyc. Bookmark the permalink. That is one great shot, Rob! Super cool space and super cool captures! Oh is that right? haha I didn’t even know that. That’s funny because I was being anything but discreet lol.